A powerful coalition of advocacy groups says they won’t support a regional funding proposal without “dollar-for-dollar” investment in biking, walking, and transit projects. 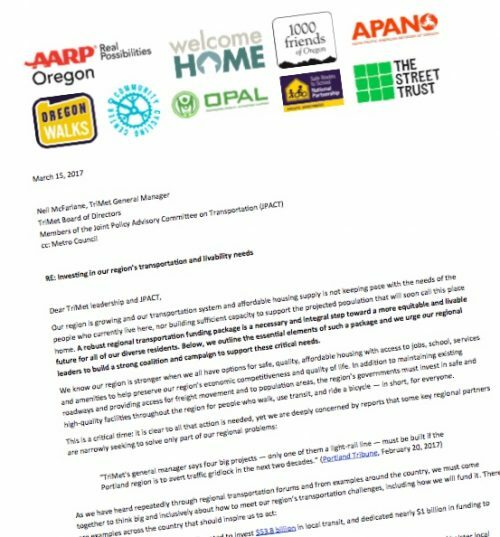 In a letter sent last week and addressed to TriMet General Manager Neil McFarlane, the TriMet Board of Directors and members of Metro’s Joint Policy Advisory Committee on Transportation (JPACT), the leaders of nine groups said the existing proposal — which is being worked on behind-closed-doors — is too focused on freeway expansions. For several months now, a cabal of regional policymakers and power brokers have cooked up a plan to fund four major projects: expansions to Highway 217, Interstate 5 and Interstate 205; and the SW Corridor transit project. Last month, McFarlane emerged from the shadows to advocate for the proposal — a move that baffled advocates who questioned why our transit agency would promote infrastructure investments that will make driving easier. In response, BikeLoudPDX is encouraging activists to speak out in opposition at TriMet’s upcoming board meeting. This new letter is a serious ratcheting up of opposition to the mysterious funding proposal. Its signatories include: 1000 Friends of Oregon Deputy Director Mary Kyle McCurdy; AARP Oregon State Director Gerald Cohen; Asian Pacific American Network of Oregon Associate Director Duncan Hwang; Associate Director; Community Cycling Center Communications and Marketing Manager Steph Routh; OPAL Environmental Justice Oregon Deputy Director Vivian Satterfield; Oregon Walks Executive Director Noel Mickelberry; Safe Routes to School National Partnership Regional Policy Manager Kari Schlosshauer; The Street Trust Policy Director Gerik Kranksy; and Welcome Home Coalition Director Jess Larson. The collaboration of these groups marks a significant step forward in regional advocacy for active transportation. It’s important to note this coalition doesn’t oppose the freeway expansions. They say they’ll only support a package that also funds biking, walking and transit at commensurate levels with highway projects. And that any funding package must adhere to six key principles. “In addition to maintaining existing roadways and providing access for freight movement and to population areas, the region’s governments must invest in safe and high-quality facilities throughout the region for people who walk, use transit, and ride a bicycle — in short, for everyone. 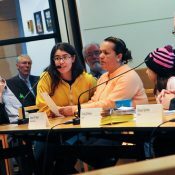 The coalition then highlighted four local funding measures that recently passed in Seattle, San Jose, Los Angeles and Atlanta. The common theme in all of them was significant investment for biking, walking and transit. The nine coalition members refer to themselves as “partners” on the regional proposal who simply want to help make it better. If these regional power-brokers want the support of these groups — and the thousands of people they represent — any proposal that comes before votes must include these six principles: funding for maintenance and operations of existing facilities; active transportation infrastructure that focuses on safety; transit infrastructure; “equitable outcomes and community benefits”; congestion mitigation that includes congestion pricing, tolling, and more mode choices; and an equitable approach to housing impacts. As funding debates heat up in the region (and in Salem), this letter is a flare in the night sky. Now we’ll have to see whether policymakers and bigwigs choose to see it — and more importantly — heed its warning. — Read the full letter here (PDF). 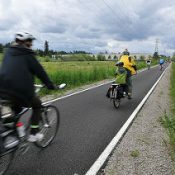 Can BikePortland please list email and/or phone contacts so that readers can take up action items? Do you have an email or office number for McFarlane? We should be blowing up his inbox! Also… the Trimet Board is appointed by Governor Kate Brown. 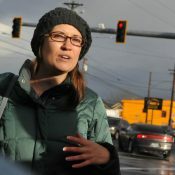 Although I think this distance from Portland metro-area voters is a problem (I think the ideal solution is to have the Metro board also govern TriMet, perhaps with an extra elected executive to manage TriMet), the Governor is the only avenue through which voters can influence the Board so please contact her. I was thinking the same thing (that is, that it makes sense for Metro to call the shots in respect to TriMet). Anyone know where to find his contact info? It’s a small investment to stave off the next transportation crisis. Still, I expect shock when building for more cars delivers just that. There is no crisis. There is an induced problem which can easily be induced. What do we want to induce? Carpool, bus, train and bikes….Right? 1) carpool lane during rush hour from Salem to the border with Washington. 3) covered bike lanes from Salem to Washington. Just use heavy duty material like those used to shield kids from the sun. Give everyone 5 years. Then start rolling sov traffic during rush hour. There is no more a crisis for traffic then there is for water. Are you suggesting that if we had some extra bus capacity, we could “induce” the bus full? Of if there was only a little more bike capacity on our streets, it would be filled by riders that weren’t there before? Induced demand is an interesting concept, but it is not magical, and not without limits. There is some level of base demand that is very stubborn to dislodge, and some limit to demand that even infinite capacity could not exceed. I don’t know how wide that band is, nor how close to one of the edges we might be. I don’t think anyone does. If you think of capacity as more than seats, then there is considerable ability for transit to induce demand by reducing travel time. This is done most easily with more frequent service to reduce waiting time, but also by operating faster service. This “demand” can come from people who used to drive because it was more convenient than poor transit service. Yes, the trick is to make transit better relative to other options, especially regarding convenience, speed and reliability. If Portland could do that, the base demandfor cars would be a lot less stubborn to dislodge. All trimet has to do is get me home from work in one hour instead of the three it currently takes. I would happily trade my 35 minute drive for a one hour ride. Three hours is a show stopper. No kidding. I willingly trade my 20-45-minute drive to work for a consistent 1-hr bike ride every chance I get. But taking 1.5 hours (minimum) to use transit only happens when the car is in the shop and my bike has two flat tires and broken cables that I don’t have tubes and parts on hand to replace. So, do you think Trimet doesn’t examine current demand and traffic patterns now to determine routes? But yes, you can induce demand for buses by a)putting down a route that works for X number of potential rides b)creating a route that matches SOV travel as close as possible…and for the magical piece C)Give priority to that transit mode. This is effectively what light rail does..just rather expensively. Why there isn’t fixed rail or BRT to Salem is incredible. But yes, make SOV less attractive and rail/BRT more attractive. People will move. Oh..and don’t make the dork move RTD did by charging 9 dollars to the airport. I hope this letter is going to other leaders as well. In 1960 or perhaps even 1980, the sort of parity called for in this letter might have been understandable, but in this era with the looming threat of climate change it is no longer good enough to propose parity. We need to be done once and for all for cars-only/cars-first infrastructure. I totally agree with you, but I think this is sort of a crafty move. In order to meet this demand, our transportation authorities would have to build only half of what they currently propose. That would probably mean scrapping at least one of the projects, and the light rail wouldn’t be the one to go. I get that. And the pressure to articulate a position that will be recognized as politically realistic, etc. However, just as the BTA needed Bikeloudpdx, this coalition needs someone to introduce a dose of 21st Century reality into the conversation. Fantastic news; huge thanks to all the groups that have signed on. Now: what kind of dystopian world do we live in where advocates have to tell the *transit agency* that things like transit should be funded equally or instead of freeways? The TriMet board needs an overhaul apparently. They should oppose all (not) “free”way expansion. It will do nothing to alleviate traffic and will only encourage driving. Take the money and spend it on a real commuter train between Salem, Portland and Vancouver. This will get enough cars off the road to move the remaining cars and trucks quickly. Transit, bike and pedestrians advocates should not take the bait. Not really. Sorry, the problems in our transport system are outside of a train from Salem to Portland. Don’t you think the thousands of commuters traveling between Salem and Vancouver might be causing some of the problems in the transport system not to mention the traffic in Portland and the space taken by parked cars? Are there thousands of people commuting between Salem and Vancouver? Our traffic issues are primarily caused by people living in the Portland area. You are mistaken if you think that Salem to Portland commuters are the biggest issue to deal with. I ask all readers! Please write a short email to demand more than equal funding. We should spend $5 on transit for every $1 we spend on the induced demand of wider freeways for cars. Or attend the meeting 8:20am Wed March 22nd. – stop citing people with fines for riding with no fare. So, we think the 5% who ride bikes in PDX, need the same dollar expenditure as the 95% who drive motor vehicles? Y’all didn’t vote for HER did ya? This is silly. Everybody benefits from ‘alternative’ transportation. I’ll tell you what is silly. Freeway expansion as a way to solve congestion. pretending that we can just keep doing this car/truck/internal combustion/fossil fuel thing in perpetuity. Maybe you’ve heard about climate change? About the need to wean ourselves off fossil fuels? Hey Kids! Smokey says don’t play with the climate or you will get burnt up! You should know what you think, so not sure why you need to ask. Y’all didn’t vote for Putin’s muppet, did you? 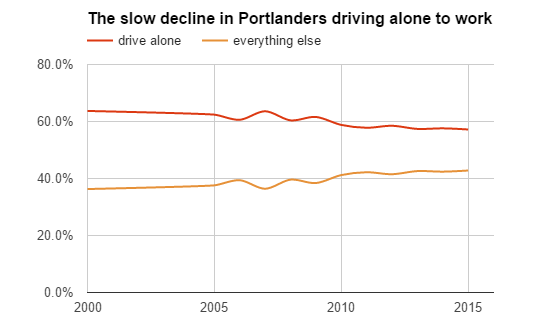 portland’s single-occupancy motor vehicle commutes have been falling for decades and are at an all time low of 57%. Good point about the 43%. Do we know the breakdown on how much is spent on non-freeway transportation? If we had the numbers for the past 10 years or so that would be interesting – maybe we are at the 43% already? There has been a lot spent on MAX, bike lanes, freeway maintenance and some widening, etc. Right now we need it all. How ‘r you counting the $200M for studying the CRC? To be fair, rail is frickin’ expensive, though I’m not sure if it’s more than highways. Bike infrastructure, on the other hand, is cheap. I’d much rather see bike infra and things like BRT get funded over more useless street car lines. Yes, light rail is VERY expensive – that’s why I’d like to see the numbers. I suspect the percentage spent on “other than freeways” is fairly high. We’ve had a lot of light rail expansion, the fancy pedestrian bridge, etc. Nah, I would not count the $200M wasted on the interstate bridge since nothing was actually built. I’m talking about funds spent to build stuff. So let me ask you how you would count the money wasted on the Eddyville/Highway 20 foolishness that ended up costing nearly $400,000,000? It boggles the mind to imagine spending $150 million on, say, bike infrastructure 7 then ODOT blows it up, starts all over, spending upwards of $200 additional million more to fix the first fix, that wasn’t even necessary to begin with. pbot does not fund light rail or the streetcar. and most of those funds come from the federal government, not the city or county. As I mentioned last year, the freeway interchange redesign at Woodburn alone cost more than what Portland’s entire bike network is valued at. In a car, I wait in line with a lot of other cars and trucks (generically, cars, because I’m lazy and don’t want to type cars and trucks repeatedly). We can only go as fast as the first car in line, who may or may not be paying attention to the light. A certain number of cars can get through a specific signal during the time it’s green, and that’s predicated on what the first car in line is doing. It’s also dependent on if there’s a back-up on the other side of the intersection, delaying the cars in line even further. Now– take two of those cars out of the line-up and put those drivers on bikes in a bike lane. Those two people on bikes (colloquially, bikes because again, lazy) don’t have to wait in that line of cars. They don’t have to wait for that first car, who may or may not be paying attention. They can get through the light and on their way with only the delay of the red light to contend with. Since two cars are now not present (being people on bikes in a bike lane instead), in theory, at least two extra cars could make it through the signal that wouldn’t have before. And, it’s a cascading effect– the more lights you make it through without delay, the sooner you get to your destination. Therefore, in my non-scientific observation, bike lane and bike/pedestrian infrastructure benefits motor vehicle travel. Your premise that the 5% who bike need the same dollar expenditure is a false equivalency, as that dollar expenditure benefits all, not just the bicycling part of road users. 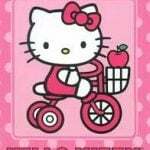 Yep, I can bike or drive my car on any given day, and the hairier the bike ride, the more likely I am to drive. What you say is about right I think. The problem is that so few are riding bikes that the bike lanes don’t help that much to reduce congestion. They’re great for cyclists and are definitely needed for a minimum level of safety. If they can build out some separated lanes so people are safer maybe more will ride. I still think there could be at least one street running E/W and one running N/S in PDX where only bikes and residents are allowed – there would still be intersections to negotiate; and maybe the residents could be restricted to one-way traffic. An entire street for bikes might make more feel safe enough to ride. It could be done as an experiment for a few months maybe. Gee. maybe we could call them Greenways or something like that. What a good idea. Imagine a greenway without any cars or stop signs along the way. Now you’ve got a bike superhighway. Greenways are good, but are not for residents only – I like driving on them because traffic is slower. 🙂 On the bike superhighway I’m thinking about, each block would be one-way for residents/deliveries, but 2 way for cyclists. I think residents would be very happy to have a house on this street. Actually, I don’t mean “one-way” for residents/deliveries – I mean dead end for cars at the end of each block, but open for bikes to go thru. So, cars can drive to their house, park, and then go out the same way they entered the block. Nirvana for the home owners and for cyclists. your first one works as well. Alternating one way streets with contra-flow parking protected bike lanes would achieve, for about $2k per block, a continuous bike path, but only one block at a time access for very local users. NACTO did a general population survey not that long ago asking people if they would consider using a bike for transportation. About 8% said they either would or already do; 33% said ‘no way, no how’; and fully 60% described themselves as ‘interested but concerned’ about their safety. The more truly safe bike facilities you have, the more you alleviate that concern and the more potential cyclists you have. Unfortunately, this is one of those games where you build it and they come (an axiom proven by outcomes in other cities that have connected networks of protected bike facilities). I can think of a lot of people who would like to save $9000 a year on transportation if they thought they could do it without risking their safety. Unfortunately, biking in Portland is less safe and comfortable than ever between the surge in homeless camping on facilities and the ever-increasing number of aggressive drivers from places where nobody bikes. You have to be pretty fearless to get around on a bike here now, and that’s why you don’t see that many people doing it – at least not in the winter. In summer, a lot of people who don’t understand road rules start biking around the city in groups, effectively blocking car traffic in areas like the Pearl, which makes for a much safer biking environment. That’s great, in principle…keeping in mind that congestion can arise with a lot of people riding bikes, similar in some ways to how congestion arises from a lot of people driving. The congestion arising from biking, is in some ways, arguably less of a problem than congestion arising from driving, but wherever many road user are using a given road all at the same time, congestion is still a problem that has to be worked out. Portland already seems to have some of that biking congestion problem on routes like, is it Williams Ave? And across the Hawthorne Bridge MUP. Close-in small neighborhood Ladd’s Addition has long had a congestion problem arising from people biking, who opt not to take light signaled streets on the seven by nine block neighborhood’s border, instead choosing the neighborhood’s quieter inner streets, at which they tend to decline to stop at the stop signs, with resulting problems. On San Francisco’s apparently highly popular for biking, less hilly route, ‘the wiggle’, biking associated congestion seems to be part of the reason people biking the route, don’t want to stop at a stop sign regulated intersection there. Maybe a traffic light would be more effective at moving more people traveling the road by bike, at one time. At current levels of bike use on streets, riding most of the streets now with bike lanes, isn’t much of a bike congestion problem at all, because in most situations, so few people are biking on the bike lane at one time. So 0% walk and take public transit? Excellent misreading, sir. Nowhere is it even suggested that the “same dollar expenditure” be made for bike-only projects as freeway projects. Commensurate does not mean equal, it means proportional. I believe the current estimate for the freeway projects is 2.4 Gigadollars. What’s 5% of that? $120 Million? Now if we wanted to be aspirational, we could think about the metro area’s stated goal for bike commute share by 2030—25%—and go with that number instead: $600M. Really both of those numbers should be higher, because we ought to assume that $2.4B is merely 95% of the total, rather than the entirety of spending, so the remaining 5% would be more like $126M, and 25% would be $800M. Plus there is the notion that induced demand works for good as well, and if we actually build safe bike infrastructure that connected to anything, the share of bicycle trips might increase to fill it up. Any lawyers read this blog? Describe in general terms how TriMet’s attorneys would argue that municipality with substantial governmental powers might pass muster under the 14th Amendment. Hint: it never has been challenged on the grounds that its appointive board violates voters civil rights (e.g., the protected liberty interest all Americans possess to vote for and against local government policy-makers). Novel constitutional theories rarely work. Especially when advanced by non-lawyers. TriMet is very likely constitutional. I’m not sure the Oregon State legislature agrees with your assessment, Kitty. A statue provides that TriMet can be taken over by the directly-elected Metro council — that’s “Plan B” in the event a 14th Amendment claim were to be brought. TriMet’s constitutionality is not a random topic — it was discussed in a lawyers’ forum. The group concluded the board exercises general governmental powers, and performs governmental functions, within the meaning of both Hadley v. Junior College District, 397 U.S. 50 (1970), and Avery v. Midland County, 390 U.S. 474 (1968). I believe it when someone wins in court. Nonetheless, I think Metro _should_ take over TriMet; they’re a little more in touch with the local sitch than Salem is. There is nothing unconstitutional about Trimet’s set up. It’s been around since 1969, no court is going to shut them down. As for Trimet being under Metro, what exactly is going to change??? Ask Packy how well a Metro run government organization works? Oh yeah, he’s 6 feet under. Metro is also the group planning the idiotic SW light rail that serves few and is being built so the guys at Metro have something to put on their resume. “It’s been around since 1969” — that’s not an argument, it’s a plea for mercy. You can do better, Dave. If you can’t cite any authority that might justify an appointive-board entity possessing all those governmental powers, at least try explaining why our state’s statutes require all other mass transit authorities have directly-elected boards. Art – feel free to file a lawsuit. Your chance of winning is really low but go for it. But putting Trimet under Metro isn’t going to change a darn thing. Also, you know, an elephant. Kind of the strong silent type. I’d question if it is legit also. Seems like a lot of unelected power there and that’s not good. Hope the some of the bike infrastructure investments all of you are advocating for goes on the west side too. The vast majority of bike investments have been on the east side of portland. We don’t even get Sunday Parkways because we don’t have enough bikeable roads. So before you all get on your high horse and condemn spending on freeways, consider how much the west side gets screwed so we’re forced to drive or take the bus. Oh yeah, all but one of the MAX lines is on the east side too. Hall and TV Hwy have decent bike lanes. Is it a separated bike lane? NO, but you can ride on it and there aren’t too many stop lights. Lots of streets on the west side have bike lanes – they do need to be swept more often though. Separated bike lane on Hall and TV Hwy?? Where??? Any bike lanes that exist are poorly planned and end a few blocks later. All of the bike money is being spent on the East side. The Portland area is more than just the inner east side of Portland. My concern is that this transportation package will adopt ODOT’s “vehicle miles travelled” road tax, which is disastrous from an environmental and energy conservation perspective. Strong testimony this AM from many.